Here are some of the best examples of NPO Pinterest efforts that really do the job. 1The U.S. Humane Society is the nation’s leading advocate for the adoption of pets without families and the ethical treatment of animals. The organization must always compete with the overwhelming need for loving homes for the animals at its shelters. The Humane Society’s New York branch chose to pilot a Pinterest campaign that lets visitors look at the adorable dogs the group has on-hand, hoping to encourage adoptions with the same impact as its famous TV commercials, only for the Internet age. Here are the Humane Society’s boards on Pinterest (4,635 followers). 2The essential nonprofit charity:water brings clean, potable drinking water to impoverished communities all over the world. To reach people who are lucky enough to be able to take clean water for granted, the NPO uses Pinterest to put a face to the people stakeholders help. The heartwarming Photo of the Day board captures indelible moments of the charity’s efforts coming to fruition, while campaigns bring celebrity star power and the gear album lets potential stakeholders see merchandise they can buy to support charity:water. 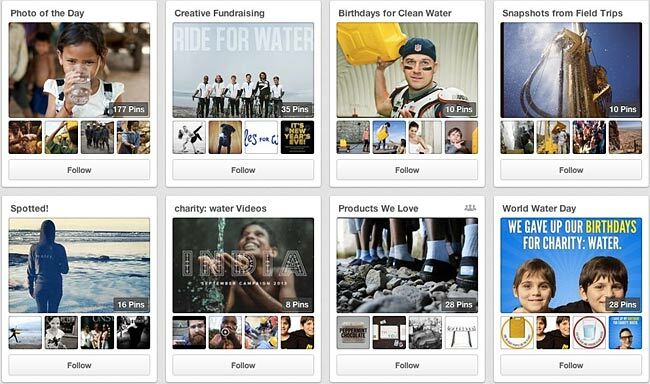 Here are charity:water’s boards on Pinterest (6,612 followers). 3The color purple is central to the awareness campaign of the Pancreatic Cancer Action Network. This means there are a lot of vibrant images tied to its efforts, from grape-colored proceeds gear to purple ribbons that let people show their support for the organization. PCAN’s Pinterest page displays all this purple passion and then some. In addition to gear pics and wristband images, the page contains albums featuring survivors and their stories, pinnable messages of support for other social media pages, and great photos of recent rallies. This lets potential stakeholders learn about the organization before they send credit card info for donations. Follow one of PCAN’s Pinterest boards (1,985 followers). 4The University of Washington Botanic Gardens had a rough time in the early 2000s. The beautiful Center for Urban Horticulture suffered an arson attack in 2001, but the space came back bigger and only more lush a few years later. This facility is not only the site of an extensive botany library and acres of conservation grounds, it also happens to be one of Seattle’s loveliest event venues. The CUH has a UW Botanic Gardens Pinterest page shows potential guests how they can achieve a dream wedding against the backdrop of flowery arches, idyllic countryside vistas, and all the bounty of the Pacific Northwest in springtime. The Pinterest page is central to the CUH’s marketing and brings 50 weeks of solid booking to fund the not-for-profit preservation program. See the UW Botanic Gardens boards (257 followers). 5Jolkona is a charitable group on the cutting edge of technology and one-on-one giving. It leverages the highly successful concept of micro-transactions and micro-donations to support hundreds of small charity projects all over the world, and it markets its program using the latest technology. Not only is its extensive Pinterest page full of stunning photos of the communities it helps and interesting infographics and promotions for its ongoing projects, it also uses Pinterest’s video uploading feature. Most people aren’t aware that Pinterest allows users to include video clips in addition to still images, but strong efforts by groups like Jolkona may just popularize the video tools Pinterest offers. Follow one or more Jolkona boards on Pinterest (1,575 followers). Social media has been as big for NPOs as for anyone else. Pinterest joins other successful platforms like Facebook and Twitter in making it easier, cheaper, and faster to reach as many stakeholders and sympathizers as possible. Teddy Hunt is a freelance content writer with a focus on technology. He spends most of his days surfing the web and watching SportsCenter via the bundle.tv package he recently purchased.